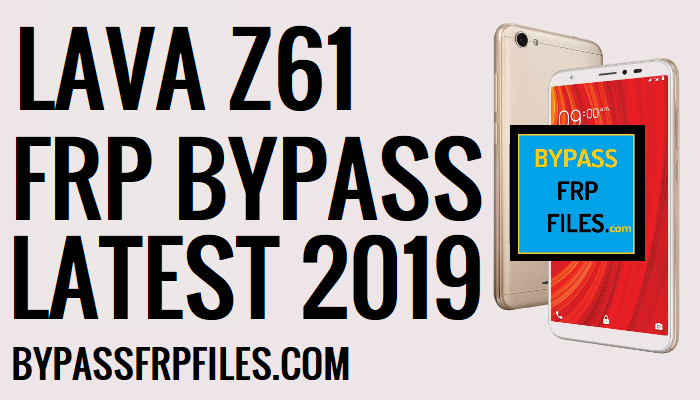 Too many users facing Lava Z61 FRP lock issue to there devices and find solution in Google, so finally we found a solution to Lava Z61 FRP Unlock, follow the below guide step by step if you need a great solution to Unlock FRP lock from your device even without using any box, This is the latest method that we found while we try to Bypass FRP Lava Z61. Note:- This method we tried to Bypass FRP Lava Z61. FRP is (Factory Reset Protection) for our Latest Android devices, if you forget the Pattern, Password and fingerprint lock for this you have to hard reset your device by using keys, after you hard reset your device then you need to enter the previously synced Gmail ID to using your access your device home screen once again, then why we need to Bypass? its very simple answer if we forget the Gmail ID that we enter synced previously on our device, then you need to Lava Z61 FRP Unlock and use our device once again. Download all the files from here before you started to unlock FRP Lava Z61. we are here share only one link to download the files just click on the link and download all files for free. -Then extract Lava Z61 Frp files on your computer. -Once the FRP files extracting completed, then open the extracted folder. -Now extract the “SP Flash tool” on there. -Now find there “SP Flash Tool.exe”, Then run the “SP Flash tool.exe” from there. -After that, Click on”Download Agent” tab, and give the file path of the ‘Download Agent” file (it should be in the flash tool folder) and then press “Open” button. -Then click on the”Scatter-loading”, then give the file path of “MT6739 MTK Scatter” file (File should be in the Flash file) folder and press the “Open”. -Now go to the “Format” tab by click on the “Format” icon. -Then check the “Manual Format” from there. -Now open the “MT6739 MTK Scatter.txt” file in notepad. -Now type there “FRP” and then hit enter. -Once you get the search results, then copy format address. (Address must be matched with below Address). 0x2d88000 => Begin Address field. -All files are now successfully selected, now you to format the frp storage to Bypass FRP Lava Z61 successfully. -After that, Install the Lava Z61 USB Driver on your PC. -Then Open the “SP Flash Tool” and then click on the “Start” icon from there. -That’s mean your device flashing will start. -Great, you have successfully Lava Z61 FRP Unlock. -Once FRP Lock is remove then power on your device. -Then you will see “Tool DL Image failed” problem and your device bootloop problem. -So Follow the below process to complete. -Open the “SP flash tool” once again. -Then click on the “Green-Download” button. -On Now connect your device once again to PC, just power off your device then connect to PC. -Once finish then check you will successfully fix Lava Z61 Tool DL Image failed problem. Thanks for visiting us, Comment below if you face any problem With Lava Z61 FRP Unlock | Bypass FRP Lava Z61, we will try to solve your problem as soon as possible. you can check other some tutorial here to help you.